Early Girl Quilt Company is a quilting store and sewing space in Audubon NJ. Owners Sharon Kelly and Kim Martino purchased the shop in July 2017 as a way to share their passion for all things quilting and sewing with other quilters and makers. We offer biannual retreats, monthly "Sew What", and Modern-"ish" Quilt Guild meetings, and many wonderful classes. New class offerings are added frequently to our line up. 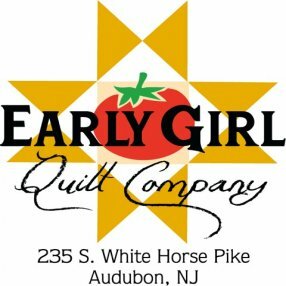 Make sure to follow us on instagram and facebook @earlygirlquilts to see what's new and for sneak peeks at samples, classes and activities. What’s best about Early Girl? We are always busy creating new quilts kits and samples. Customers visit not only to shop but to see the continually changing inventory of fabric and to watch what is going on in our studio/classroom. Best of all, the staff loves nothing more than to help customers chose beautiful fabric for their projects and then enjoy the end result when they proudly return with a finished project. We strive to build a community of quilters and crafters who love to share what they do and inspire each other to learn and explore in our creativity. So, sign up for a class or give us a call and let us know how we can help you “get your craft on”!